I've known Sharon Silverman for years as a fellow designer in the craft industry. We have met in person at several industry shows and I have contributed designs to Sharon's other books in the past. I designed two crochet pieces for her book, "Beyond Basic Crocheting": the beaded crochet lace wrap on the cover and a crochet motif cardigan, too. Sharon invited me to be a part of a new book last year and I agreed to design two crochet garments. I designed and crocheted a large scale motif pullover with a really unique construction method using Be So Fine Yarn in color iced silver fox. And, I designed and crocheted a pullover with a deep plunging lace trimmed back using Be So Sporty Yarn in color million dollar red. The new book is called "Delicate Crochet: 23 Light and Pretty Designs for Shawls, Tops and More". You can order it pre-order now on Amazon and the release date is December 2018. Below is the press release for this book, and wait until you see all of the talented designers Sharon curated for this collection! Stackpole Books is proud to announce the December 2018 release of Delicate Crochet (9780811719889, $24.95, Paperback) the indispensable book for inspiration and instruction. Pattern contributors include Kristin Omdahl, Robyn Chachula, Marty Miller, Vashti Braha, Karen McKenna, and others known for their innovative, gorgeous crochet designs. Each of the 23 patterns includes full written instructions and charts as needed. All special stitches are fully explained and skill levels range from easy to advanced. 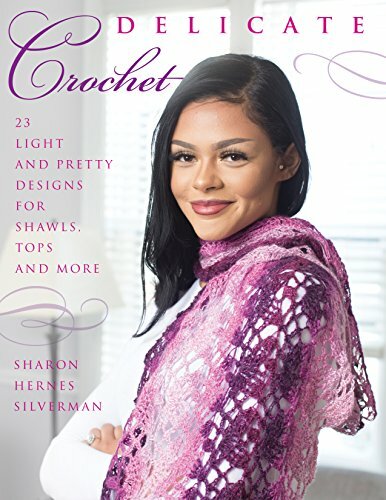 Sharon Silverman is the author of seventeen crochet books, including Crochet Cowls and Tunisian Crochet. She was a featured guest on HGTV’s fiber arts show, “Uncommon Threads” and is an instructor for Annie’s Crafts online classes. Known for her fashionable creations and crystal clear instructions, Sharon is honored to have had her designs published by leading yarn companies including Louet North America, Lion Brand Yarn, and Plymouth Yarn Company. Her private line of patterns is available through Ravelry.com. She resides in West Chester, Pennsylvania. You can find Sharon online at www.SharonSilverman.com. Check her out on Ravelry: CrochetSharon; Facebook and Pinterest: Sharon Silverman Crochet. Stackpole Books® is the premier publisher of craft titles, covering everything we love to create and everything we need to know to do it better. Written by top craft experts and beautifully packaged with full-color photography and detailed tables and illustrations. Stackpole Books provides comprehensive information to craft and fiber art enthusiasts of today and tomorrow. Vashti Braha promotes crochet as an art, hobby, learning tool, and practical medium. 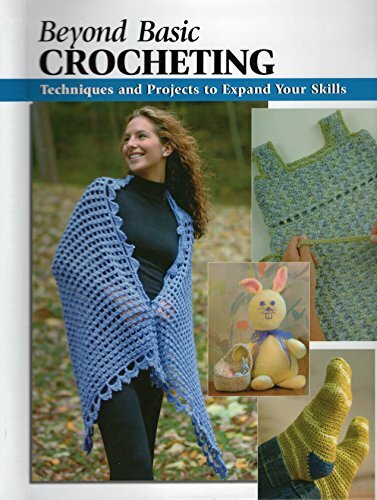 Her designs have been published in Interweave Crochet, Crochet! and other magazines and books. Her crochet classes consistently sell out. DesigningVashti.com includes how-to videos and the Lotus yarn shop. Her newsletter covers topics that she doesn’t see others writing about. Kristin Omdahl is a powerhouse in the yarn industry. She is the author of 14 books and hundreds of patterns. Her award-winning YouTube channel provides in-depth tutorials and resources for knitters and crocheters. The Kristin Omdahl brand of yarn and accessories is all sustainable and thoughtfully sourced. Amy Solovay is a freelance writer and pattern designer with a background in textile design. She writes about crochet and other crafts for websites including knittingandcrochet.net and crochet-books.com. Amy’s patterns draw on her experience forecasting color and fashion trends.